Attend VTUG Summer Slam 2016, your chance to choose a FREE TinkerTry'd Supermicro SuperServer Bundle 2! You may have recently read about VTUG Co-Leader Chris Williams, in my recent post about falling DDR4 prices that are helping make Supermicro Xeon D-1541 SuperServers more obtainable for virtualization enthusiasts who are always thirsty for more RAM. Well, just so happens he's taking delivery of his very own new SuperServer today actually, as he prepares himself for yet another certification. Earlier today, Chris confirmed the great news behind the email blast that VTUG founder Chris Harney sent out this morning. Yes, it's true, this is the first time globally that a Supermicro SuperServer SYS-5028D-TN4T mini tower bundle is being offered as a give-away. Not bare-bones, but a rather powerful little beast, blessed with 64GB of memory! 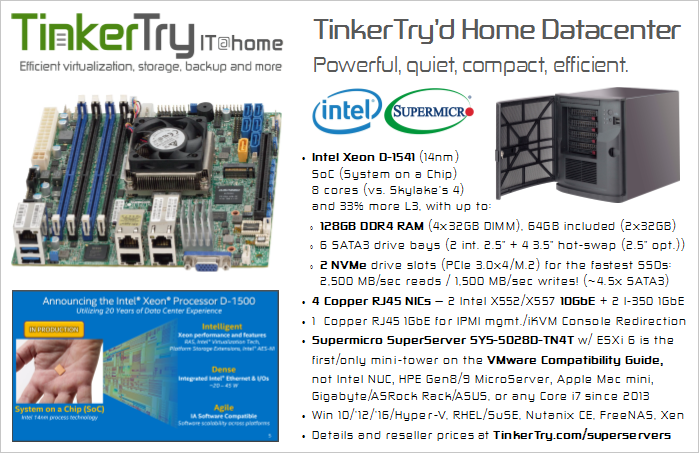 Because it's a TinkerTry'd Bundle 2, there's those extra goodies that make it so easy to simply install a drive and power right up, ready to install Hyper-V or VMware ESXi immediately. That's right, the BIOS and IPMI is already flashed for you, the system has been 4 hour burn-in tested, and the BIOS configured properly to make your ownership experience a joy. Instant fun and/or work, no tinkering required! I'm also giving away 2 free hours of remote consulting to the lucky winner, just in case some questions do crop up. help so many folks get started quickly. This enhances the ownership experience, getting the most out of their significant hardware investment like the many hundreds before them. Doesn't hurt that this system is now on the VMware Compatibility Guide. Of course, I'll be at the VTUG Summer Slam again this year, with my very own SuperServer coming along for the ride. Who doesn't travel with their 15 pound datacenter? The winner's chosen prize will be mailed to their home, brand new.